No contributor articles done so far so I will fill this in and repost tomorrow with a tweet to say when. I will state anyone triple captaining. Apologies that I forgot last week. Rob Reid Aguero, possible TC to be confirmed? So Sane has the slightly better numbers and is more rounded to goals and assists. Aguero has the better underlying stats and shooting volumes plushas penalty duties. How many minutes Aguero and Sane will play is the difficult question and it’s a question that only Pep can answer. 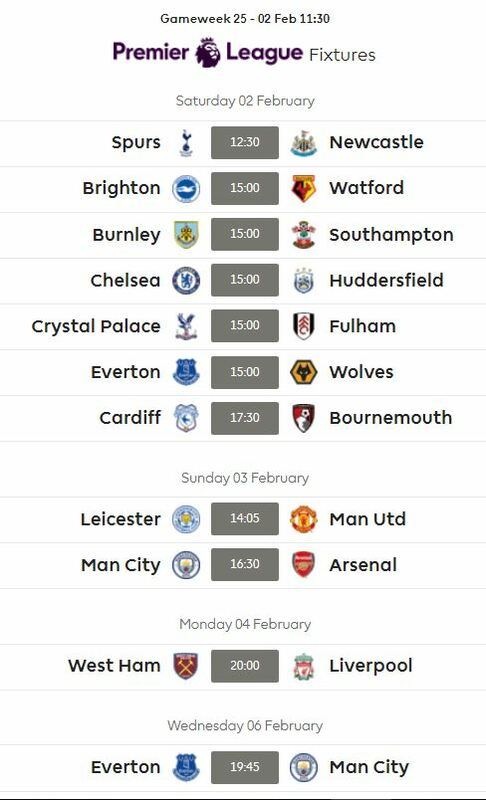 The general problem for any City player is that they play Arsenal Sunday, Everton Wednesday and then Chelsea Sunday again. Sane since Mendy got injured before gameweek 13 has started 11 games and been a sub in 1. It’s worth noting that in his 5 sub appearances this season he’s only averaged 13 minutes per appeance. However he’s only not started 2 games this season. In the 11 starts since Mendy’s injury he’s averaged 79 minutes and played 90 minutes 6 times. However the last 3 games he’s been subbed in the 70’s averaging 72 minutes. Mendy played 30 minutes in the EFL cup but has been out of the last 2 squads with some sort of minor reorrcurence. However he has trained twice although Pep has helpfully said he’s just day to day. Mendy is Sane’s biggest issue as he is the natural alternative to play wide left. Aguero played alot of games around the 60 minute mark earlier in the season. Since he’s come back from injury he’s started 5 of 7 games and played 90 minutes in 4 of those games. He has been a sub in 2 games though and played 40 minutes in 1 and 14 in the other. The risk is that Jesus who has been in good form. Certainly last season if Aguero wasn’t going to play it was away and I personally would be surprised to see Jesus start at Everton. However as I also said this is all guess work. The Arsenal away defence is 15th for goals conceded with 22 from 11 games. That’s the same amount of goals as Hudderfield and only 1 less than Cardiff. The xG conceded situation is far better and they are 6th. They have conceded far more goals than they should have for whatever reason. What’s more they have 2 CB’s out in Holding and Sokratis and Koscielny 50%. Bellerin is also out. The Everton home defence is 9th for goals conceded with 20 goals from 12 games. They are 8th for xG conceded. The Everton defence also have some issue with Digne suspended, Baines doubtful and Mina injured. Gametime is impossible to summarise and you really have to read the section above. 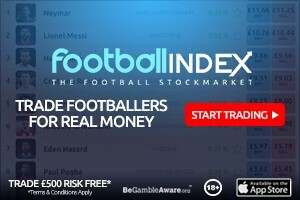 The bookies odds for anytime goal scoring see Aguero at £1.75 vs Arsenal compared to Sane at £2.10 although Sane has considerable more assist potential. 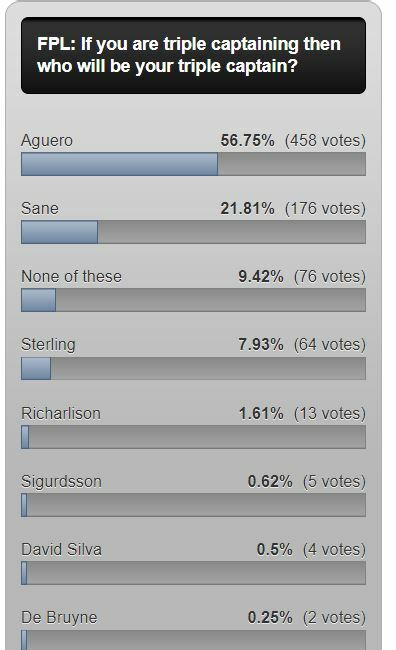 The polls are quite close but on average it’s Aguero 42% vs Sane 25%. In terms of actual stats Sane is better off but Aguero has stronger goal threat underlying stats by a reasonable margin. It’s a difficult one due to the gametime and takes away from any logical stats based decision making it a bit of a lottery. I probably trust Aguero more so assuming I make the transfer he will be the one coming in. 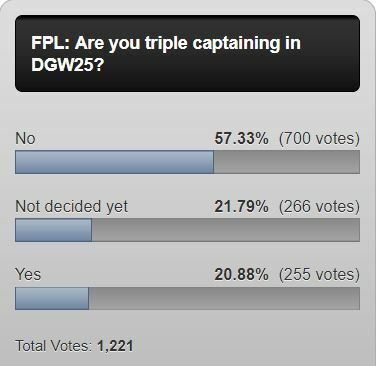 So quite a low % are triple captaining and most are going for Aguero. I think that’s a reflection of the gametime risk. 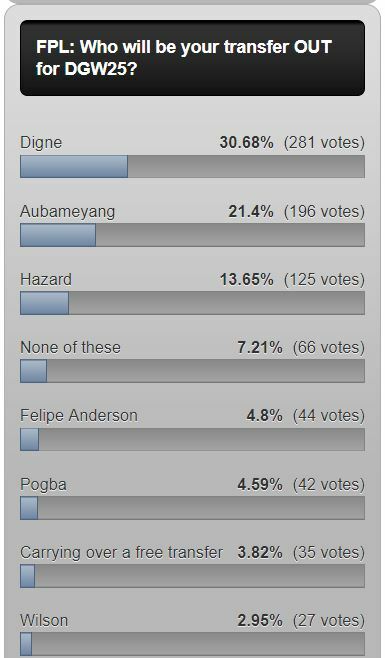 Hi.Great analysis as always..when the poll went up, I was surprised to see no Hazard listed to vote for, bearing in mind he has Huddersfield at home ??? That was my mistake he should have been in the poll. Very stupid of me . Apologies. Gary I dont know if you heard Solskjaers press conference but he indicated that Pogba would be fine.. For me Sane was never a captaincy option over Aguero because only Aguero is capable of doing what he done yesterday i.e score a hattrick. I didn’t, no. Working away at the moment with fairly limited access to anything, so had to make a bit of a snap decision.